The UCSC Center for Entrepreneurship invites you to our 2nd Annual UCSC Entrepreneurship Showcase on June 7, 2014 at 1pm. 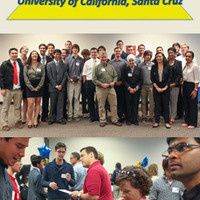 This festive annual event connects the community with UCSC student entrepreneurs who have been developing business concepts, prototypes, and business plans. The afternoon will include networking, meeting the students and hearing their business pitches, and a keynote speech by distinguished entrepreneur and executive, Bill Grosso, CEO of Scientific Revenue. An experienced Board of Judges will award prizes to the top student teams, and everyone in attendance will vote for the People's Choice Award. In total, $10,000 will be awarded to student teams. Find out the latest about entrepreneurship at the UCSC Center for Entrepreneurship.Network with business leader, investors, and venture capitalists.Meet the Jack Baskin School of engineering dean, faculty, and students.Witness the birth of innovative new ideas.This Entrepreneurship Showcase is sponsored by the UCSC Center for Entrepreneurship and the Baskin Alumni Advisory Council (BAAC).